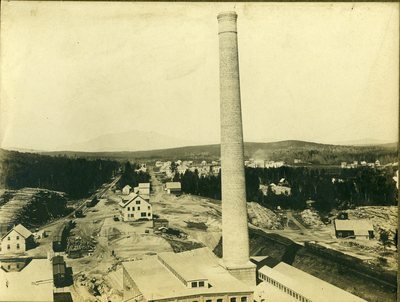 "Millinocket, Maine, Mill Exterior "
This is a scanned image of a black and white photograph of the exterior of a mill in Millinocket, Maine. Part of the surrounding town can also be seen. The photograph is not dated, but it appears to be from circa 1904.